This Monday (6/30), Foodstand is partnering with The Welcome Table to put on the Local Chefs Tasting Pop-Up! Click here to buy your ticket before they all run out. We’re interviewing each local chef that will make magic happen on Monday in the lead-up to the event! 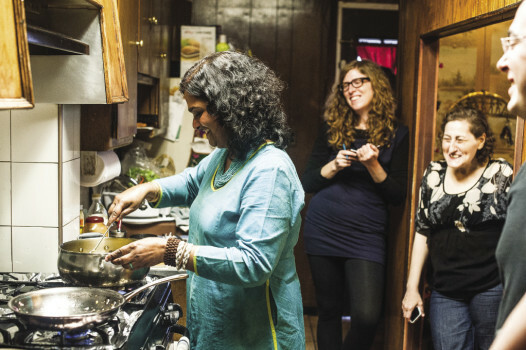 Today’s feature is Chef Mukti of Mukti’s Kitchen! A: I started this in 2006, before that I worked as a biologist for 23 years. I’ve always loved to cook and loved to feed people, that is my passion, but I never thought it could be the source of my livelihood until 2006. Chef Mukti in her element. Q: Describe to me your most cherished food memory. A: I grew up in a food hub, in Calcutta, India. It’s a big city. I learned my cooking from my mother and aunt, and every time we had a big festival in our house, I was the taste tester. Every time, I would observe how they cooked, and I used to tell them whether anything needed to be added. So I grew up seeing these big festivals in my house, and how everyone would prepare the food. Q: What is your comfort food? A: Rice and fish curry. Q: Are your dishes new and unique, or would you say they’re more traditional sorts of foods? A: No, I improvise my own dishes, I think they’re new and unique and not commonly found in restaurants. Q: So how do you think up new dishes then? A: You know, cooking is an art, so you can improvise your stuff if you have good knowledge about your food and your ingredients, then you can mix and match this with that, and I think that’s really the best thing you can do. Once you get more skill and experience, new things come from trial and error. A: When I see other chefs, and they’re doing really good work and are involved and doing really good work in the food movement, and giving a sense of pleasure and encouragement to others. It inspires me to believe that I can do the same. A: I think my cooking style is very much an art. When people see my cooking, they’ve told me that it seems like I’m playing music, or that I’m a conductor of an orchestra. It’s like I’m doing this thing and mixing that thing, and doing all the various things I do in my cooking, a lot of multitasking. Cooking is a sort of therapy, and when you’re concentrated on many differing things, such as chopping, or grinding your spices, I feel it’s a sort of very fun multitasking sort of exercise, and I feel it’s very therapeutic. Q: What are some of your favorite simple dishes to make at home? A: Most of the time, when I make food for myself at home, it’s very simple. Things like lentils with rice, fish curry, a vegetable side. I grew up with fish, so we have to have fish pretty much every time we eat! Get excited! And make sure to buy your ticket if you haven’t already!